Home Uncategorized Those Fascinating Facts: Keep or Cut? A few weeks ago I was invited to be part of the 35th Annual Children’s Literature Conference at Northern Illinois University. 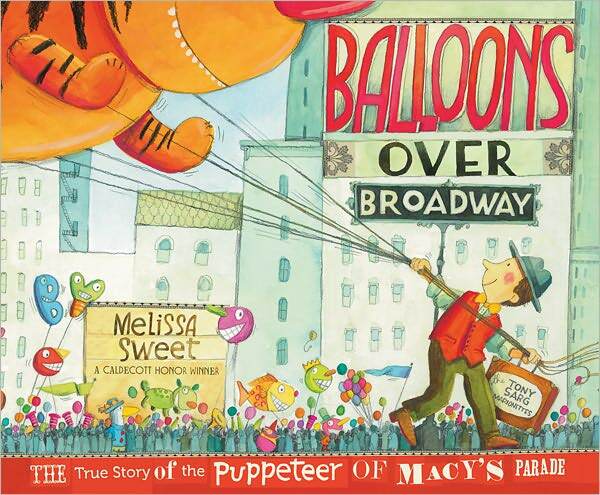 This year’s conference topic was “A Celebration of Picture Books For All Ages.”One of the main speakers, Melissa Sweet, shared how she wrote and illustrated her award-winning picture book, BALLOONS OVER BROADWAY. Seeing photos of her gorgeous art studio and hearing about her creative process was interesting. Yet I found her journey of writing the story even more fascinating. 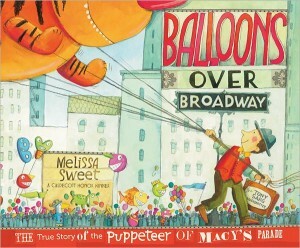 During Melissa’s research of Tony Sarg, the artist/puppeteer who designed the first helium-filled balloons for Macy’s Thanksgiving parade in 1928, she discovered many compelling details about Tony’s life. 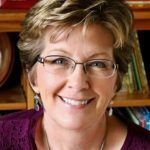 As the revision process progressed, she had to decide which details worked best in the story and which nuggets she would have to leave out to create a focused, effective picture book. Oh, how I felt her pain and angst. 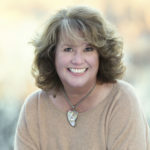 That may be the most challenging part of writing nonfiction for me–after discovering an incredibly interesting, little-known fact that took me months of research to find, I must end up cutting that juicy detail because it doesn’t serve my story as a whole. One captivating fact Melissa learned about Tony Sarg during her research was that he made silhouette animation films using pieces of cut paper. If I’m understanding his technique correctly, Tony moved pieces of paper, took a picture, then continued moving the paper pieces and photographing until he had hundreds of photos to create a short animated movie. Although Tony’s films were incredible, she decided information about his movie making career didn’t work in her picture book about his famous balloons. 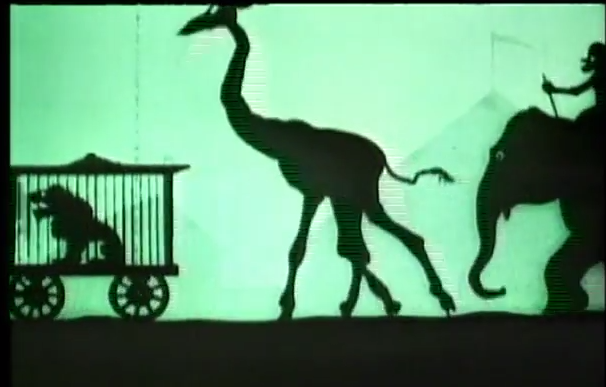 But Melissa did give an ingenious nod to his silhouette craft by incorporating a silhouette illustration in one of the book’s spreads. How cool is that? But never fear, authors often have back matter pages–Author’s Notes, Timelines, and so on are perfect for sharing those precious nuggets you must cut from your text for the sake of story. So the next time your critique group suggests removing beloved facts that aren’t directly related to your main story thread, you might try moving them into your Author’s Note for safe keeping. Funny thing is, if you’re like me, the next time you trim your Author’s Note you may decide some of the “darling facts” you’ve hung onto don’t seem that crucial any longer. In fact, you may end up cutting them from your book entirely! This could not have come at a better time, as I revise a nonfiction piece. Thank you, Suzanne, and lucky you! 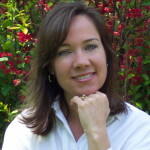 I adore Melissa Sweet’s work. Yes, I was very lucky to meet Melissa. And also very lucky I get to work with clever illustrators! 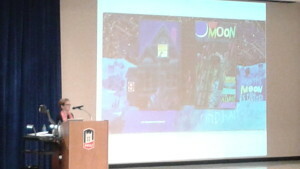 I love Melissa Sweet’s work and would have loved to hear her presentation. So talented! Your following comment makes so much sense, thank you for sharing this little tid bit of organisational information! Actually, I was laughing at myself this afternoon as I removed a fact from my Author’s Note which I added there when I took it out of the main text about a year ago . Huge fan of Melissa Sweet. Thanks for telling us about the silhouette illustration — kid readers love that kind of inside scoop! 🙂 Suzanne, do you have any recommendations for the length of an author’s note? From my experience, Authors’ Notes can vary greatly in length and scope. In fact, THE INVENTOR’S SECRET contains 3 notes–an “Author’s Note”, a note about Thomas and Henry’s friendship, and another note called “Details About Inventions” which shares cool information about the inventions in the main text. When writing a new story, I just try be as judicious as I can about the back matter notes and only include information I think is incredibly interesting and pertinent to the main story. In the end, your editor will help determine what content works best for the note(s), which is often dependent on the number of back matter pages. Thanks for the info, Suzanne! The Too-Many-Facts syndrome. I always struggle with that. Great post, Suzanne!